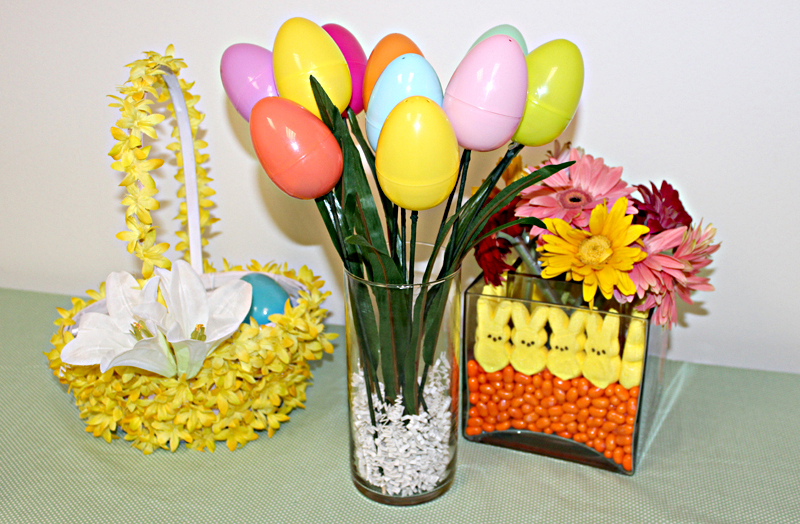 Turn brightly colored plastic eggs into an impressive bouquet with just a few simple steps. This DIY Easter craft can be used as not only an adorable Easter decoration, but also as a creative Easter party favor for kids! Simply fill the plastic eggs with festive treats for a deliciously sweet surprise. Open the plastic eggs and fill with Easter candies and treats. Seal the eggs back up. Take a candy-filled plastic egg, and observe the bottom of the egg. There should be 2 small holes and one indentation in between those holes. Use the scissors to deepen the middle indentation slightly so the pointy end of the skewer can perfectly fit into it. Apply glue dot or adhesive over the same indentation and adhere the pointy end of the skewer. Hold 3-4 seconds to secure. Starting from the top, begin wrapping the floral tape around the skewer. Once you reach the bottom, use scissors to cut the floral tape from the rest of the roll. Take one of your leaves and add a glue dot or dash of glue to the inside, near the bottom of the leaf. Wrap around the stem of your egg flower and hold to secure. Now you’ve created a beautifully sweet Easter egg flower kids will love picking! If you’re looking for more DIY Easter crafts, take a peek at our Floral DIY Easter Basket, DIY Easter Candy Centerpiece, and Pressed Flower Easter Egg Craft.